At the end of the summer (is it really Fall already?! ), we visited my Brazillian friend Kely in East Hampton, NY — OMG! 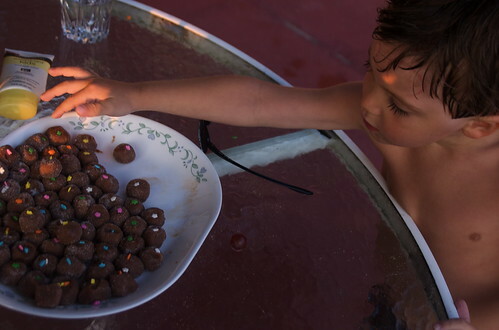 what a wonderful day of fun in the sun, cannonballs in the pool, Caipirinhas for the adults and these delicious Brigadeiros for the kids. Kely said it was super easy to make these, just pour a can of condensed milk into a pan, mix in chocolate, and heat — stirring constantly — until the mixture firms up unough that the mix comes off the sides of your pan. Let cool, then form into bite-sized balls. I found this recipe on Maria-Brazil that goes into a bit more detail.